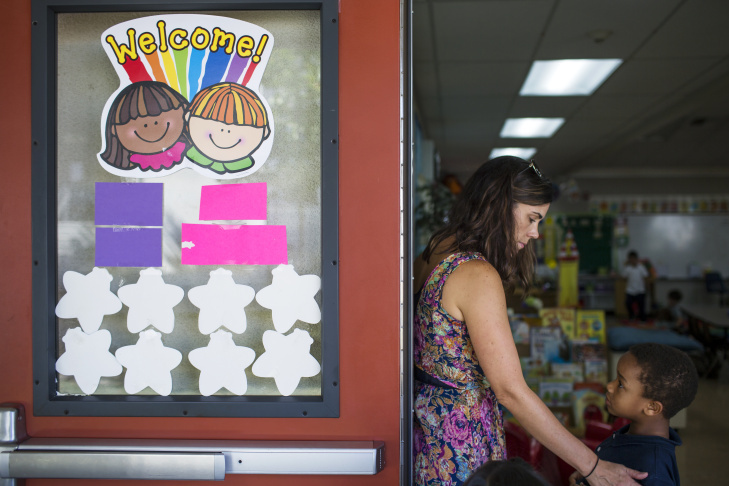 Teacher Cherie Wood, left, works with kindergartener Jeremy Campos at Willard Elementary School in Pasadena, two weeks into the school year, on Wednesday morning, Aug. 31, 2016. 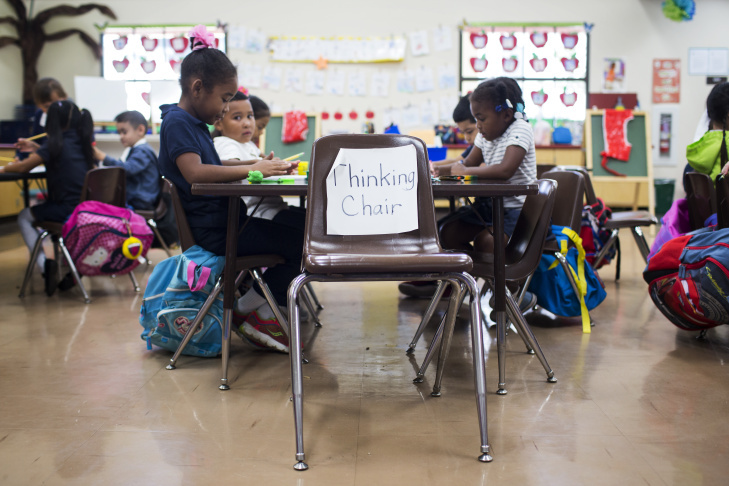 A "thinking chair" is one method used in teacher Cherie Wood's kindergarten classroom at Willard Elementary School in Pasadena. 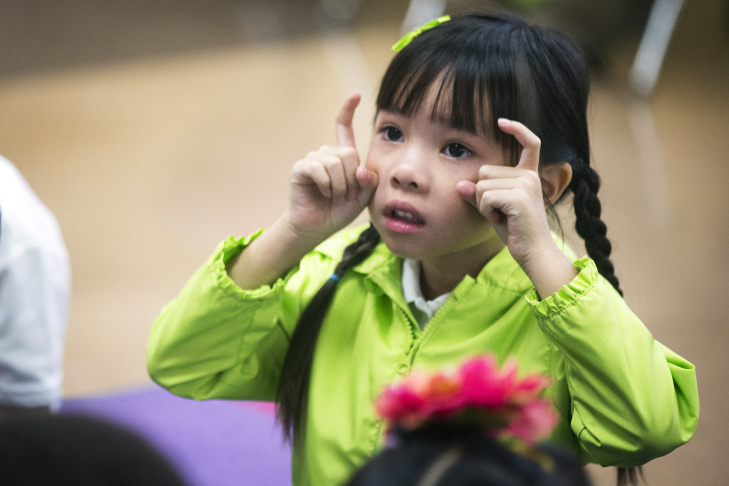 Kindergartener Kayla Nguyen sings a song with her class at Willard Elementary School in Pasadena, two weeks into the school year, on Wednesday morning, Aug. 31, 2016. Teacher Cherie Wood leads her kindergarten students through an alphabet song at Willard Elementary School in Pasadena, two weeks into the school year, on Wednesday morning, Aug. 31, 2016. Kindergarteners Kameera Turrentine, left, Daisy Mayer-Glenn, center, and Lena Winston sing a song with their class at Willard Elementary School in Pasadena, two weeks into the school year, on Wednesday morning, Aug. 31, 2016. 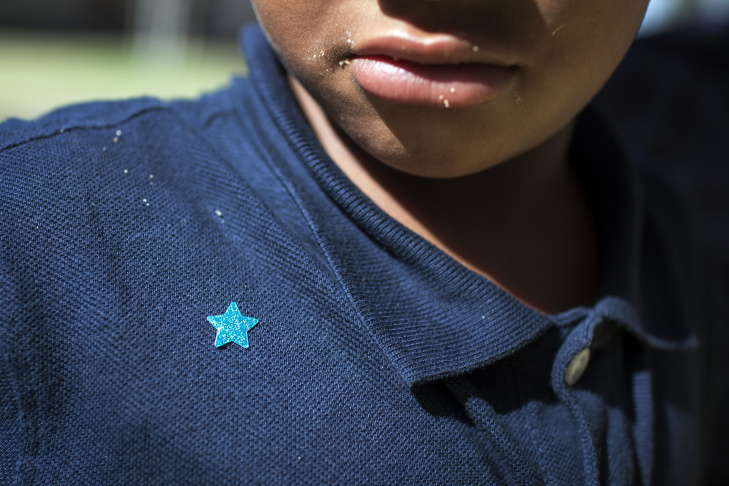 Kindergartener Thomas Harris received a star for helping teacher Cherie Wood at Willard Elementary School in Pasadena, two weeks into the school year, on Wednesday morning, Aug. 31, 2016.
at Willard Elementary School in Pasadena, two weeks into the school year, on Wednesday morning, Aug. 31, 2016. Teacher Cherie Wood reads a book to her kindergarten students at Willard Elementary School in Pasadena, two weeks into the school year, on Wednesday morning, Aug. 31, 2016. Kindergartener Dalilah DeAnda listens as teacher Cherie Wood reads a book aloud at Willard Elementary School in Pasadena, two weeks into the school year, on Wednesday morning, Aug. 31, 2016. 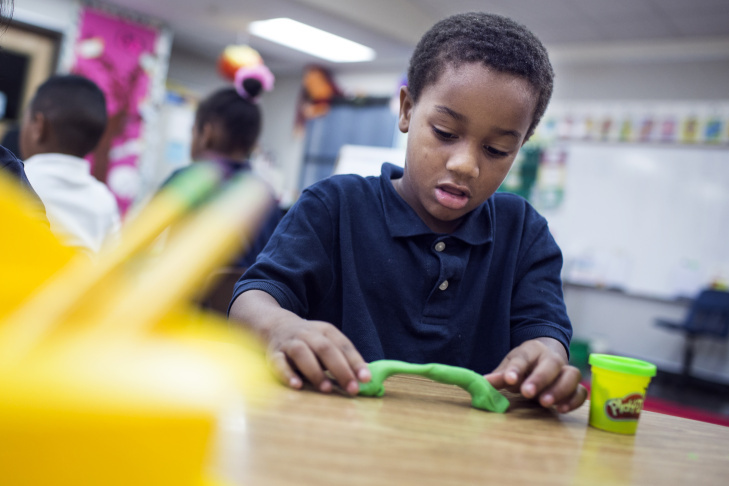 Kindergartener Thomas Harris takes part in a playdough activity at Willard Elementary School in Pasadena, two weeks into the school year, on Wednesday morning, Aug. 31, 2016. A dribble of water from a thick hose slowly fills Jackson Feola’s creation in the sandpit at the Sierra Madre Community Nursery school. He’s slapping wet sand onto the outer edges of his foot-high mound to reinforce it. “I’m playing in mud,” the four-year old said grinning, too busy to stop for an interview. His legs and arms are caked in wet sand, and as he shoveled, he warned that his volcano might erupt any minute. Feola will start kindergarten next year. He loves building volcanoes – and trenches, waterways, rivers, bridges, ponds and moats – in the sandpit. And even though he knows a lot about all of these structures, he couldn’t name the letter "volcano" starts with. 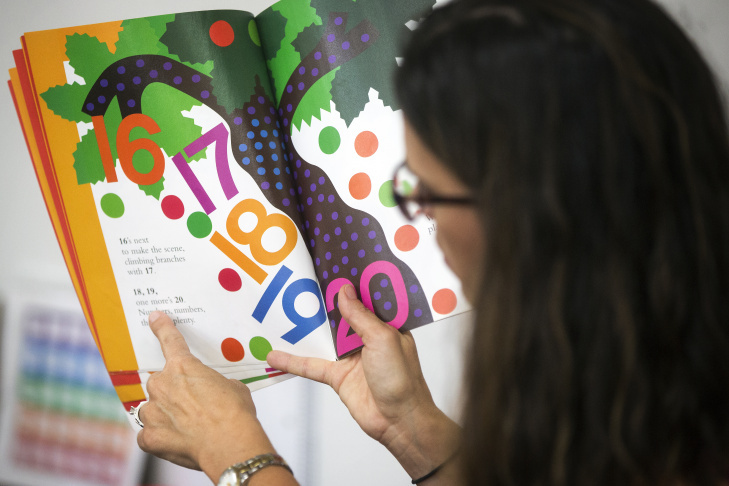 In the debate over what constitutes “kindergarten readiness,” some educators believe it's important that preschoolers learn basic letters and letter sounds. The U.S. Department of Education’s Early Childhood Longitudinal Study (ECLS) uses this approach, for example, to gauge how ready children are for kindergarten. It looks at skills like letter recognition and the ability to sound out words to test early literacy. For other educators – such as those who run Feola’s preschool – unstructured, child-directed play is a more age-appropriate way to prepare preschoolers for the challenges that will face them in elementary school. Sandpit immersion has not been a common teaching strategy across publicly-funded preschools, where children spend more time at a desk and where children might be taught how to be a good friend through filling out a worksheet. “Kindergarten is very demanding,” said Donna Garcia, a veteran early educator at Arminta Early Education Center. It's been well documented that kindergarten has evolved to cover content that first grade did a decade ago. 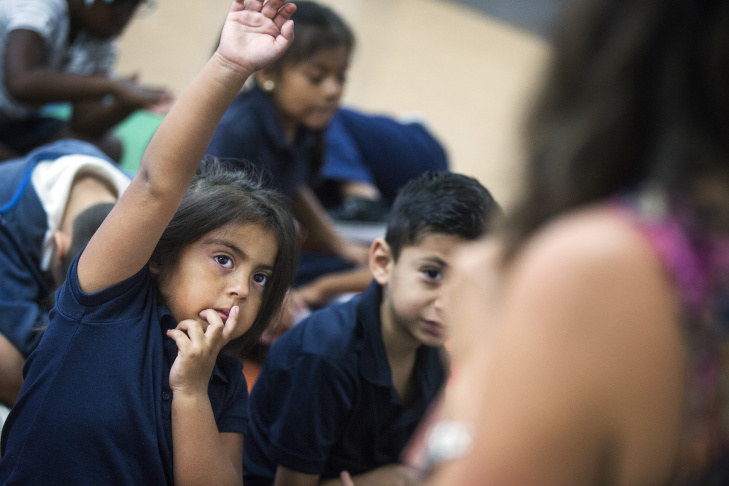 Garcia's students come from low-income families, and many are English language learners. She doesn’t want them to be the children who fall behind in school. Garcia does her best to incorporate play times for her students, and she focuses a lot on early literacy. “We do journaling, we do dictation, we have a writing table, we incorporate writing through all areas,” Garcia said. For Ceja, this meant “a lot more drilling” of preschoolers so they would be ready for the higher academic demands of kindergarten. 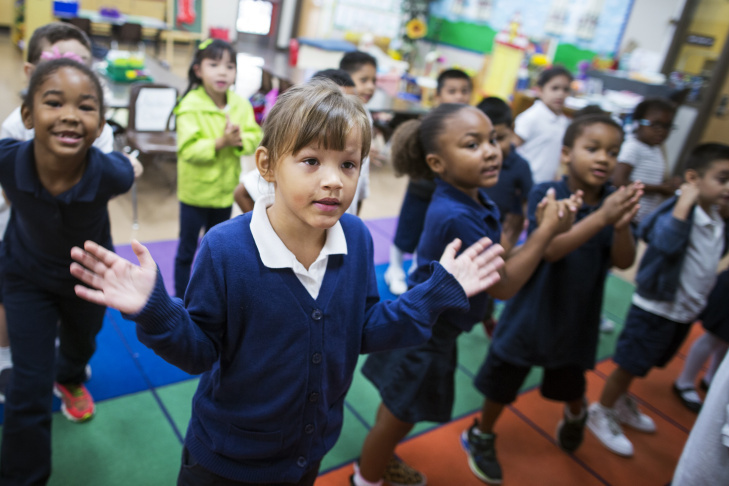 Martha Borquez, director of early education for LAUSD, understands the pressures her teachers feel to have their preschoolers learn basic academics. Borquez used to run a district early education center, and would begin the school year by asking kindergarten teachers what they wanted her preschool teachers to focus on so the kids would be prepared. The list she would get was long: Know their letters, write words and even read and write sentences, Borquez said. 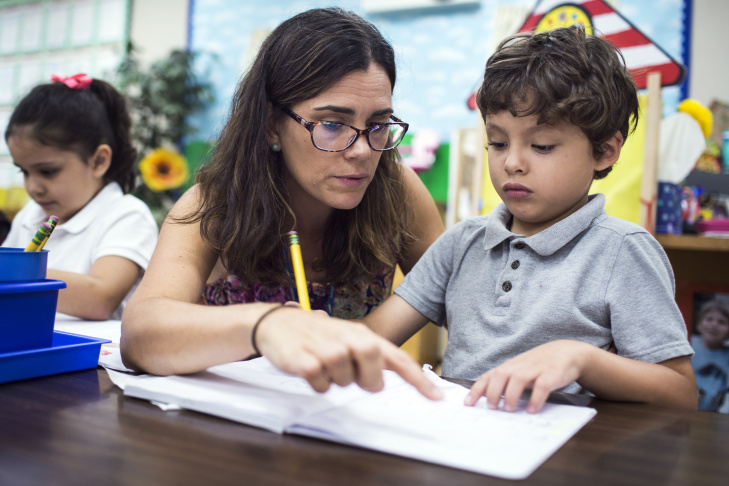 Yet when Borquez would consult the kindergarten and first grade standards, she found teachers were expecting 4-year-olds to be learning skills slated for these higher grades. “We realized that all the skills they wanted our kids to come in [to kindergarten] knowing are the skills that were taught in K through 12,” Borquez said. 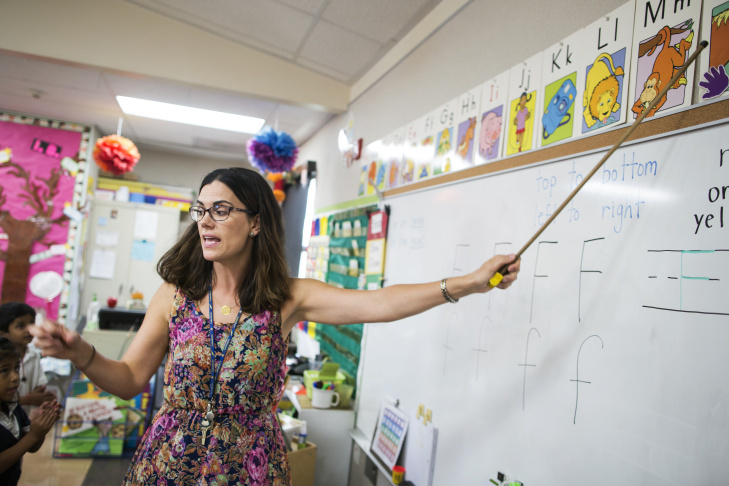 The prevailing preschool standards that the California Department of Education asks its programs to follow only require that preschoolers recognize “more than half” of the letters of the alphabet, for example. These same standards also begin with a focus on social and emotional learning – like how to communicate feelings, for example – not literacy or numeracy. Borquez and other district leaders have rolled out a new early learning curriculum to promote play-based and creative learning. She said she wants her preschoolers to have a more playful school experience and also be introduced to academics. At Jackson Feola's preschool in Sierra Madre, there is no pressure to meet standards, said veteran teacher Eileen Lucas. Her view is that making a preschool-aged child sit in a desk and learn to write letters and numbers is not developmentally appropriate. 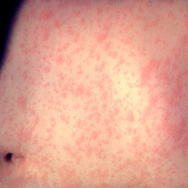 “They’re supposed to be moving their bodies and learning about the world around them, and interacting with each other, [learning] how to negotiate social activities,” she said. Research supports her view that children learn through play. Lucas said her students have a sophisticated understanding of things they are interested in, even if they are not yet reading or writing. What 4-year-old Feola could articulate about volcanoes, for example, aligns with what students will learn – as per the National Science Education Standards – when they are in 5th grade. At preschools like this, there are no letters or numbers of the day, no worksheets that help kids write or read. Lucas worries that these teaching strategies lead to preschoolers being “burnt out” by the time they get to kindergarten, and she does not feel any pressure to have her students reading or writing by the time they head to kindergarten. Pasadena teacher Cherie Wood said that it doesn’t have to be an either-or decision when it comes to play versus early academics. In her transitional kindergarten class at Willard Elementary school, Wood used play and creative learning techniques that slipped in the letters and numbers, but without repetitive worksheets. “We would do letters with play-doh, with shaving cream, with 'Wikki Stix,'” Wood said. Kids loved it, but inside the fun, Wood said, her priority was not academics. Kids with these skills, Wood said, will be ready for the academic rigors of kindergarten. This year, Wood is putting her own pre-kindergarten methods to the test: now she’s teaching kindergarten. 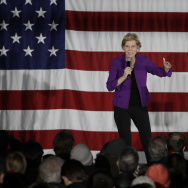 It’s a different vibe than her transitional kindergarten class of 4-year-olds last year. Her class this year is made up of some of her own TK students from last year, some kids who did not attend preschool at all, and other children who went to a variety of preschools. “I see some kids that come from more academic-based preschools, [and] yes, they know their letters and sounds, they’re starting to read and write, but they haven’t had the opportunity to play as much, so it does affect the flow of the classroom,” Wood said. The children who haven’t learned how to interact with other children or how to self-calm, for example, make her job as a kindergarten teacher harder. 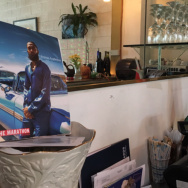 “It might take us longer to do something because we have to stop and remind little Johnny the appropriate way to sit or to keep his hands to himself," she said. To help all her kindergarten students, Wood still includes playtime inside the classroom. So when they use play-doh to make the letter of the day, then they have free time with the squishy ball of dough to create whatever they want. And the ensuing sounds of squealing and giggling reassure Wood that her students are eager and learning.